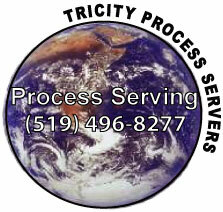 Tri-City Process Servers $65.00 (Plus Mileage - $0.65 per Km) (See Services) Kitchener-Waterloo, Guelph, Cambridge, Hespler, Preston, Breaslau and Galt. Call for service outside these areas. For your convenience Tri City Process Servers will also help serve your important documents anywhere in Ontario for a flat rate service. Rush rates are subject to an additional surcharge. With our vast amount of agents who independently own and operate offices in Canada, Tri-City Process Servers are able to keep all process serving needs cost to a minimum. With over 100 agents surrounding 10 provinces in Canada alone, Tri-City Process Servers are able to keep your costs budget friendly. Services outside the Tri-City area are may be subject to a rush service rate depending on client. THE ABOVE FEES QUOTED DO NOT INCLUDE GST/HST OR NOTARY FEES.